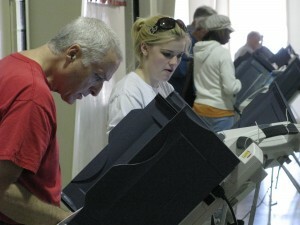 Oxford citizens fill out ballots on election day. OXFORD, Miss. – It is safe to say that a lot of people around Oxford are pretty football-focused this week, so we wanted to share a friendly reminder that Saturday is the deadline to register to vote in the November elections in Mississippi. Each circuit clerk’s office will be open from 8 a.m. to noon Saturday (Oct. 4) to accept voter registration forms. Mail-in voter registration forms must be postmarked by that day, according to information from the Mississippi Secretary of State’s office. Voters are required by law to register at least 30 days before an election day. Voter registration applications submitted after Oct. 4 will be processed by the circuit clerk, but the voter will not be eligible to cast a ballot in the Nov. 4 general election. Eligible military and overseas voters get an extended registration period through Oct. 25. Registration forms are available at your local circuit clerk’s office. You can also download an application from the Secretary of State’s website at http://www.sos.ms.gov. So, before you head out to tailgate and cheer the Rebels on against the Crimson Tide, make sure you are registered to vote. For more information, contact the Secretary of State’s office or your county circuit clerk’s office.